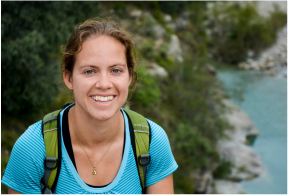 Sierra is a geochemist and paleoclimatologist who has joined the group as an NSF Postdoctoral Fellow. She uses geochemical proxies like stable and clumped isotopes to reconstruct past climate conditions. She is especially excited by the clumped isotope paleothermometer, which allows the direct measurement of past temperatures independent of any assumptions about seawater composition like those inherent in oxygen isotope-derived temperatures. Sierra is currently using this powerful proxy to reconstruct Cretaceous climate, a potential analog for our future high-CO2 world. Sierra grew up outside of Chicago, and after spending time on both the West Coast for college (Caltech) and East Coast for grad school (Harvard), she is happy to be back in the Midwest. In her free time, she enjoys running, skiing, camping, knitting, and baking. View Sierra's curriculum vitae and learn more about her from her personal website.